Are you looking for cute jewelry for Valentine’s, or fun accessories to chase away the winter blahs? Shop for original jewelry in colors and styles to suit your unique fashion style, like a cool button bracelet or bold flower necklace and there is nothing better than a pair of colorful drop dangle earrings to make you feel like a star in the middle of winter. I always look for unique jewelry styles made with cool bead shapes in bold colors and textures. In handcrafted jewelry you see ingenuity in design where jewelry designers take risks. Like a bracelet made with colorful beads in all shapes and sizes, or a necklace that has an original asymmetrical design for the most daring of fashion forward women. So if you’re brave, unique jewelry isn’t as expensive as you think and gives you a bold edge. Colorful Bead wrap Bracelet shown above has many colorful semi precious beads in interesting shapes and sizes on four circles of memory wire in a jewelry design that glimmers with so much to look at. Flirty Charm Earrings shown above have silver heart charms hanging over bold red fashion buttons. These lightweight drop dangles bring out your cool style with fun charms boldly highlighted in front of colorful fashion buttons. Vintage Style Glam Bracelet shown on the left has glamorous flower buttons accented with gold, Dragon Veins Agate, Jade heart shaped beads and crackle beads in a pretty pink retro jewelry style. Bring fabulous back with chunky chic fashion jewelry and be prepared for an influx of admirers. I’m always growing as a jewelry designer. 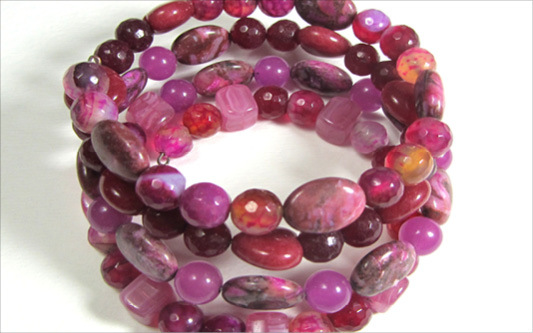 Colorful glass beads, pretty charms and fun buttons influence my creative process. I’m always trying to incorporate unique items in my designs. I create new jewelry designs through experimentation, but my creativity doesn’t just turn off when I leave my studio. I also take pictures when I am out and about and make quick sketches when too many ideas flood my brain. Recently when a necklace didn’t sparkle I lengthened the silver chain to add even more beads and buttons. Then I adjusted my bracelets to fit even more people by adding an extra toggle ring. Also for earrings I now use lever back earring hooks along with the standard earring hooks for those customers who prefer them. Lately I’ve been buying emeralds, garnets, agate, jasper and jade to mixed in with my fire polished Czech beads and crackle beads. In the future I see myself using paint, varnish and glitter on buttons. Who knows even small toys, fabric and ribbons will find their way into my original jewelry designs. Red Passion Bracelet shown above has clusters of shiny rose flower buttons and glamorous fire polished Czech beads in a smoldering retro Hollywood design. Bring fabulous back to your look with chunky chic fashion jewelry and be prepared for an influx of admirers. Diva Necklace shown above have plunging layers of eye catching buttons that bring a bold edge to your style. Cool colorful buttons hang pendant style on long silver loops and adds interest to any ensemble. So impress everyone with your new original look. Unique Button Girl Earrings are a cute fashion accessory for girls and women. These flattering drop dangle earrings pair colorful fun button shapes together and only the most adorable buttons are used. Sassy handmade earrings have fashion flare and will be favored by adorable gals everywhere. Starting a Career as a Jewelry Designer? Dreaming of a new career in accessory design, but don’t think you can do it? We are taught from a young age that being creative is good for hobbies, but for a career you must do something serious and follow the rules, it’s just safer that way. But there is no such thing as a secure job anymore. So do what you love and you’ll always learn something new. There’s security in that. You may worry that you’ll make less money making original earrings, fun bracelets and cute necklaces than if you kept your old job, but there is always a market for talented jewelry designers. You can start part-time as an accessory designer and build up a customer base to make the transition easier. Some people just have to be creative, it's who they are. So live your creative dreams and don't wait for a better time. I am creative even when I don’t feel well. I can’t make myself do many other important things at the best of times, but I can always make fun earrings, colorful bracelets and cool necklaces. And I am convinced creating jewelry makes you healthier, because you can’t be stressed when you’re enjoying yourself so much. This Candy Swirl Fashion Bracelet shown above makes a statement with big buttons combined with striped donut beads and cute square accent beads. I design fashion jewelry for big personalities, so your individual style is brought out with this original fun fashion bracelet. Long Enchanted Mermaid Necklace shown above has big buttons with donut beads, unique semi precious stones and faceted beads. Layered bead strands perfectly adorn your neckline adding striking elegance and sophistication to your style. Shorten or lengthen layers to achieve your desired look. These Fashion Star Earrings have small beads floating inside silver rings beautifully accented by fun flower buttons above and fashion buttons below. These trendy handmade long dangle earrings were created for fashion stars everywhere.